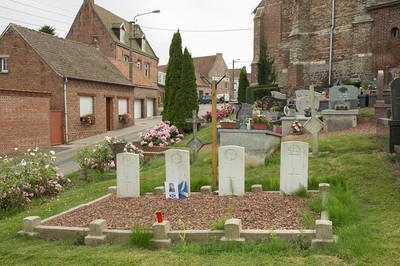 Eecke (Eeke) is a small village 4 kilometres south of Steenvoorde in the Department of the Nord between Cassel, Hazebrouck, Armentieres and the Belgian border. 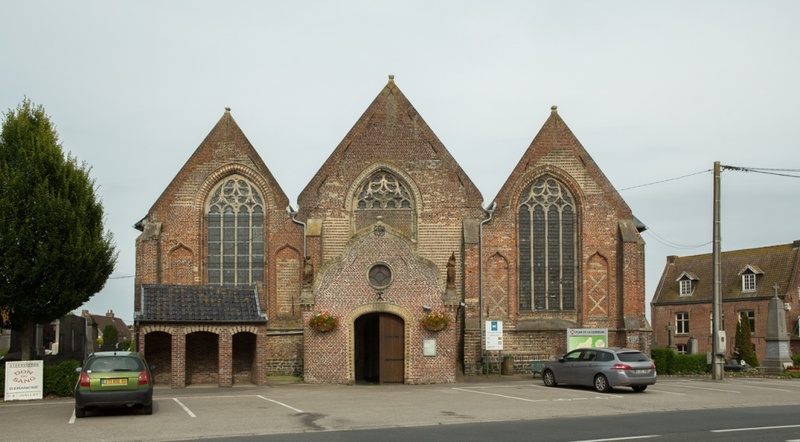 The burial ground is around the church. 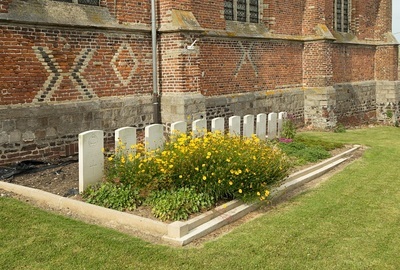 The First World War graves are situated east of the church and the Second World War graves are found to the south side of the churchyard. There are now a small number of 1914-18 and over 10, 1939-45 war casualties commemorated in this site. 114098 Private Arnold Batty, 52nd Bn. 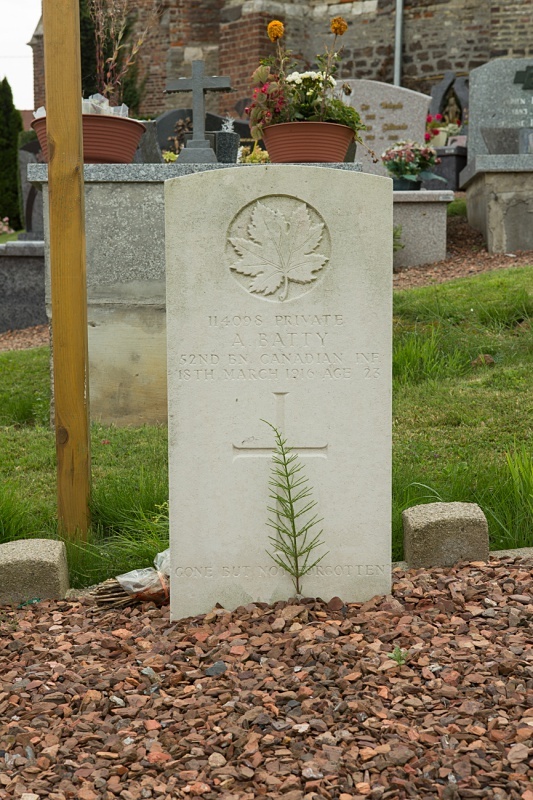 Canadian Inf., died 8th March 1916, aged 23. Son of Frank and Alice Batty, of 20, Hill St., Elsecar, Barnsley, England. 153021 Corporal D. J. Doig, 43rd Bn. Canadian Inf., died 17th March 1916, aged 22. 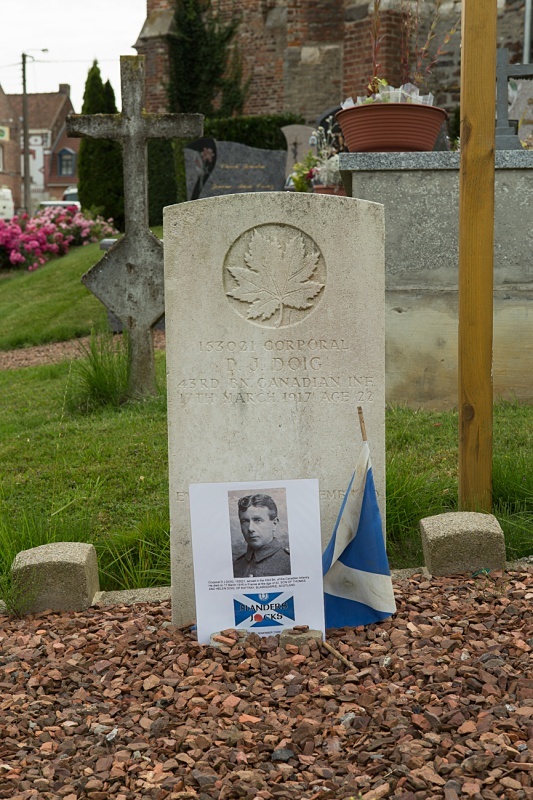 Son of Thomas and Helen Doig, of Rattray, Blairgowrie, Scotland. 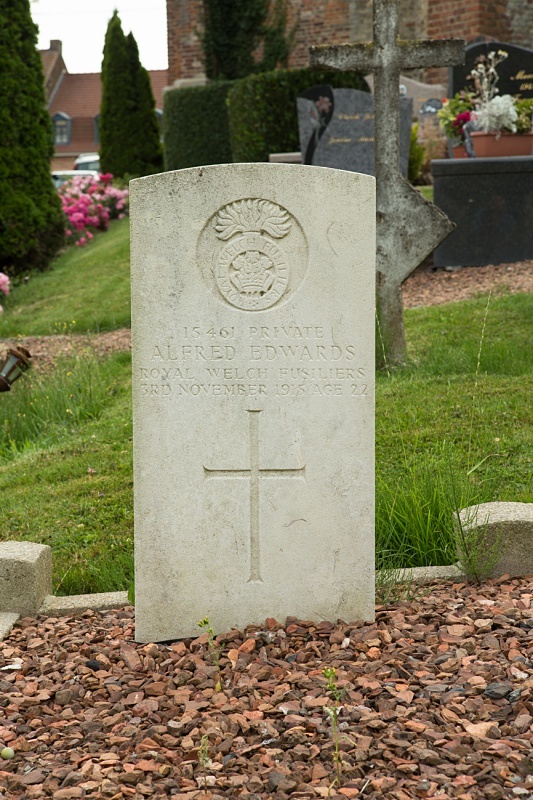 15461 Private Alfred Edwards, Royal Welsh Fusiliers, died 3rd Nov. 1915, aged 22. Son of Elizabeth Samuels (formerly Edwards), and Edward Samuels (stepfather), of Stone Cottages, Avongoch, Ruabon, Denbighshire. 15979 Private M. Martindale, King's Own Royal Lancaster Regt., died 9th April 1916, aged 24. 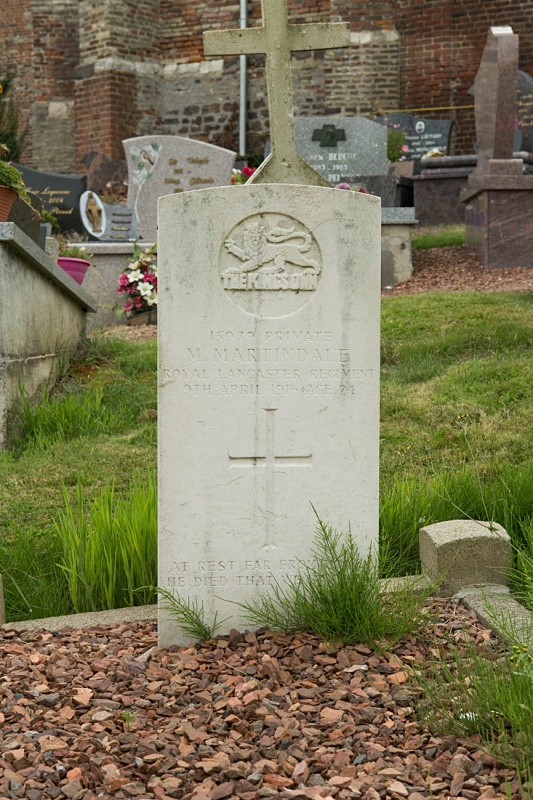 Son of Alexander and Martha Holding; husband of Mary Martindale, of 367, Preston Rd., Coppull Moor, Chorley, Lancs. 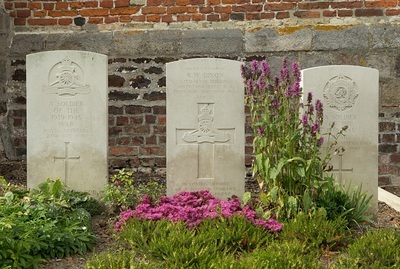 ​1461685 Gunner Robert William Dixon, 226 Bty. 57 (1/5th Bn. The East Surrey Regt.) 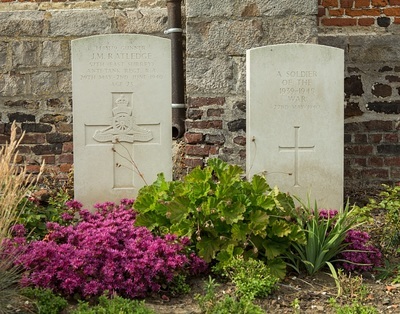 Anti-Tank Regt., Royal Artillery, died between 29th May 1940 and 2nd June 1940, aged 20. Son of Mr. and Mrs. Douglas Dixon; husband of Kathleen Dixon, of Streatham, London. 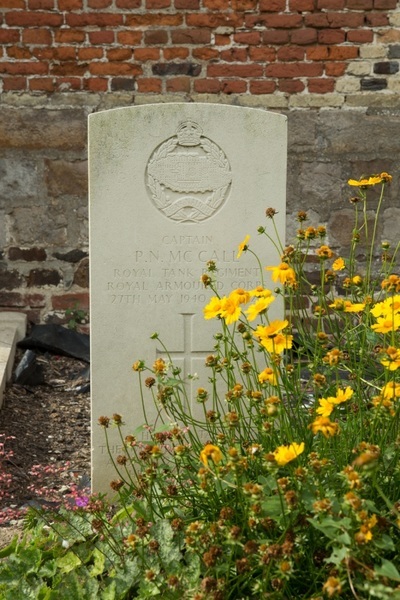 69346 Captain Peter Norbert McCall, Royal Tank Regiment, R.A.C., died 27th May 1940, aged 26. Son of Peter and Catherine McCall, of Newton Heath, Manchester. B.A. 1448179 Gunner Jack Mason Ratledge, 57 (1/5th Bn. The East Surrey Regt.) Anti-Tank Regt., Royal Artilery, died between 29th May 1940 and 2nd June 1940, aged 23.